Like a deep gash from shoulder to chest, the Great Rift Valley plunges into the heart of Africa. In the landscape to the west, below a clouded sky, a Marabou soars above everything—vast plateaux with weaving rivers, steep-sided valleys spotted with shimmering soda lakes, and a landscape peppered with cities and settlements, farms and savanna. Standing on a little promontory, we do not feel disadvantaged by the Marabou; from horizon to horizon the sweeping view is nearly as much as the soaring stork may see. There is the endless tawny gold of dry grass, flecked with emerging green, and studded with Balanites trees like dark poster-pins on a golden velvet. Extending to the grey-blue of distant hills is the grey-brown fuzz of thorny acacia and candelabra trees alternating with stream-side ribbons of deep green forest. There is the ringed boma, from where clusters of cattle radiate, bells ringing, watched by red-cloaked Masai. By the muddied river is the tinsel tourist town with large-wheeled vehicles and workshops, decrepit streets and shanty houses, signboards of luxurious resorts pointing beguilingly away from the squalor where blank-eyed youth stare impassively at wide-eyed visitors who have traveled far to be here. And there, in the distance, is the long, dark line of several thousand wildebeest. The wildebeest are hunkered down on the long walk. The rough grass is knee-high to the front-runner. As thousands of hoofs pass, press, push apart and down, tear and crush, the grass is flattened, shredded, crushed into the earth or dusted aside, until, at the end of the line, one can see hoof marks on the thin strip of naked earth winding through the grassland. The trail of the wildebeest will stay for a few days or weeks until the grass covers it again—a soft mark on the landscape, unlike the road-scars made for vehicles and the traveling people. By all accounts, this is an old, old human landscape. Humans evolved, as a species, from other primate forebears, not far from here. In the last two million years, and in the geological blink of the last ten thousand, the species spawned by this land has spread out, transforming themselves and the Earth. Today, the new peoples return to the land where others of their ilk like the Masai still live. 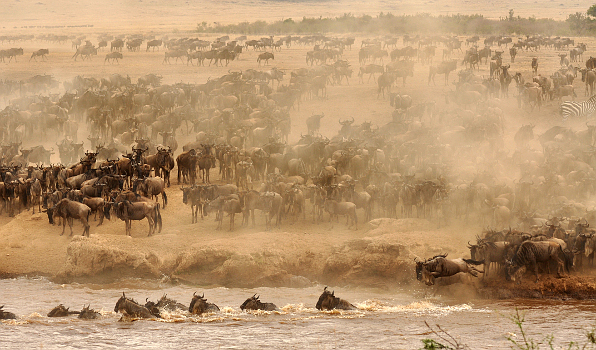 They arrive as spectators of the great migration of wildebeest. 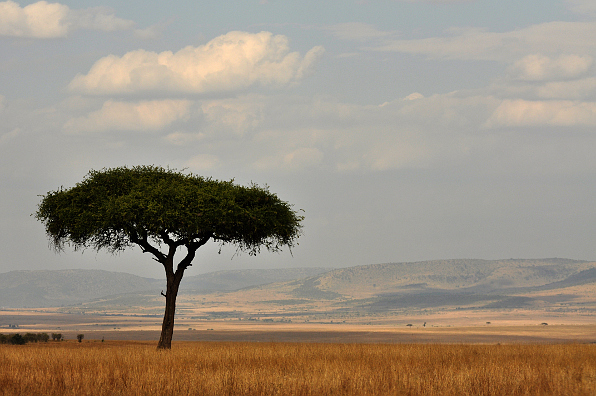 Across over 30,000 square kilometres of the Serengeti – Mara ecosystem in Tanzania and Kenya, over a million wildebeest join over half a million zebra, gazelle, and other ungulates on the annual migration. Early in the year, the journey of hundreds of thousands of wildebeest begins, too, with their birth near the ‘cradle of humanity’ in the grasslands near Olduvai Gorge in the Serengeti and in Ngorongoro. Then, as the dry season arrives and grasses begin to dry, the herds move, past feeding and mating grounds, to the north and north-east, to arrive, by June and July, in Kenya’s Masai Mara. And there they find both profusion in the grass and peril at the jaws of lions. At the Mara River in Kenya, the wildebeest throng at the water’s edge, bleating and pulsing with purpose at the perilous crossing, eyes alert for the wraith-like crocodiles in the swift current. In their great journey, the perils of the crossing appear momentary, but many do not make it across. 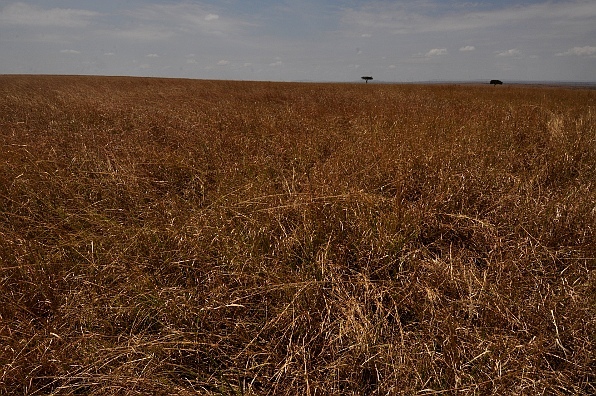 Those that do, spend the next four months in the Mara landscape, feeding in long grass woodland and savanna. 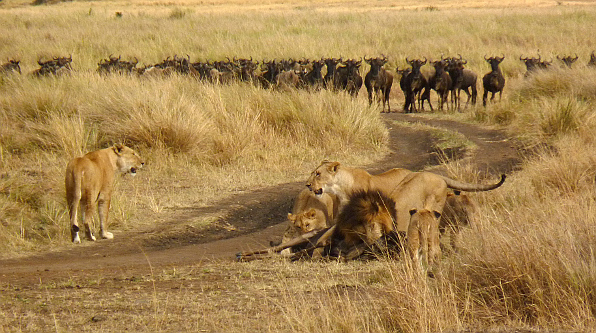 Still, the real drama is not merely in the pulse and throng of the Mara crossing. The flecks of green in humble grass, energised by sun and rain, are the markers of a greater drama played out across vast space and time. Low clouds streaking grey shafts of rain are visible from many kilometres away in the open savanna, but the migration is provoked by changes across even longer distances. 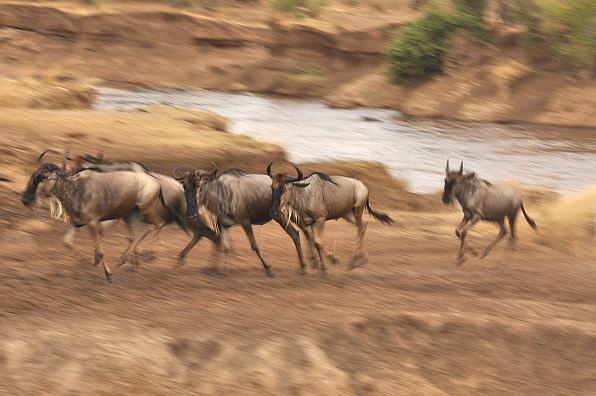 The wildebeest, incredibly, seem to track that vast sweep of rainfall and grass production. For, as rains bring lush growth to the short grass plains to the south, the ensuing pulse of nutritional profusion propels the wildebeest to loop back to the Serengeti plains. And so, the wildebeest move. And with their bodies, their feeding, and their dung, they transform the grasslands in their passing. 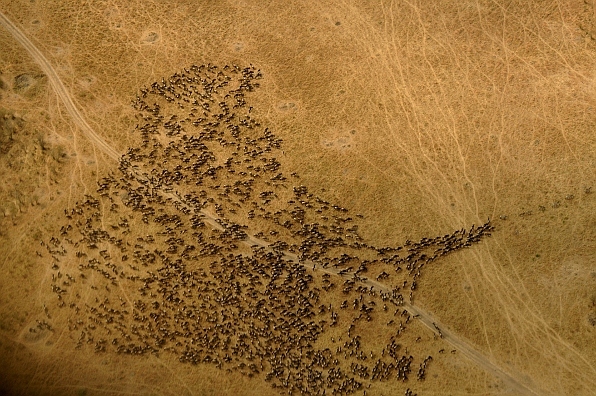 Scripted by evolution and directed by ecology, and spanning hundreds of kilometres every year, the annual migration of these hoofed engineers of a great landscape is one of nature’s most remarkable phenomena. 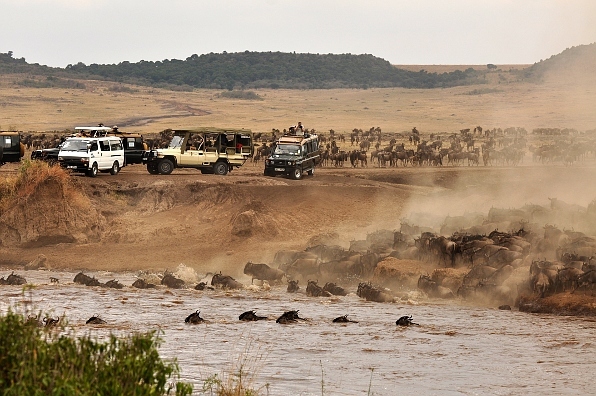 And so the people watch, at the Mara River, crowded in four-wheel drive safari vehicles, vans, and trucks. Here, nature is placed on display for the tourist. Vehicles rev and vie for the best spot for their customer to take that perfect photograph. Later, they will discuss their ‘take’ at the river’s edge, over tables set with white sheets, served French-press coffee and fresh croissants by white-gloved waiters from the resort. The hippos and crocodiles pursue ancient custom in the river, as the riverside tourist, a human whose journey originated in the great landscape of Africa, is back to ogle or ignore at will, and return to the power-fenced resorts beautified with manicured lawns and ornamental plants from faraway lands. This is the human domain, it all proclaims, and nature is out there. And when the people depart, taking photographs and memories, nature is left behind, as are the leavings of their visit. As just another species born of this landscape, the human does not seem out of place here, but his new presence and manner betrays a different sensibility. Recreational development is a job not of building roads into lovely country, but of building receptivity into the still unlovely human mind. The journey of the human, set against the journey of the wildebeest in the land of Marabou and Masai, then evokes another sense. A sense, paraphrasing the poet Gary Snyder, that nature is not a place to visit—it is home. And of this land, we are the spawn not the spectator. That what is needed to replace people within nature is not the bringing of more people and vehicles into trackless wilderness, but a realisation, espoused by thinkers such as Aldo Leopold, that nature is the land and community to which we belong. In the absence of such a sense of place, the great rift then appears not just a gash in the earth in Africa, but a rift that threatens to sunder human from nature in our hearts and minds. I got this link from Kalyan’s tweet. I thoroughly enjoyed the way you wrote about Masai-Mara migration and its relation to human beings. When I see the scenes of Masai-Mara in TV channels, I never thought of the scene the photographers and camera crew would make in that habitat. I always used to wonder how these people can capture all these without disturbing the natural environment. After reading your article I feel that it is always disturbed by the horde of tourists. I was very much moved by the line you borrowed from Gary Snyder. Awesome. It packs a punch. People need to walk on the earth bare foot to feel and enjoy it instead of going deep into the jungle with all their sophisticated stuff. Anyway, thanks for the enlightening article. Will be following this blog from now on. Visionary journey with you guys. Janaki and I were magically transformed on an escarpment overlooking Lake Chamo in the Ethiopian part of the Rift. Your words and feelings, and those of Leopold’s and Snyder’s makes me wonder yet again why our dear friends still live in cities when they really don’t have to. Saw this from kalyan’s post on FB.. Loved the way you have covered Africa. The aerial and sunset photos are just excellent and loved it the most. Glad you liked the piece (and thanks Aparajita for the welcome back!). @Vivek, yes, we need to figure out what would be a better way to really experience nature… the usual options leave much to be desired. And it is not just the wildlife, it is also the cultural experience. 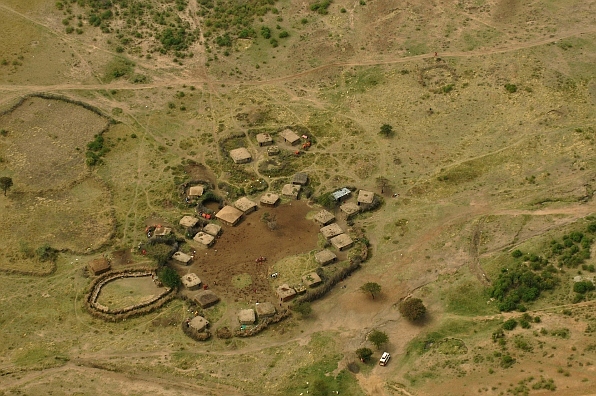 In the photo of the Masai boma, if you look carefully, you will see a tourist car in the corner, and a group of Masai standing in a line inside performing (?) for a group of visitors (Kalyan spotted this in the image!). Check out also the article linked from the boma reference. I want to go and see all this, but at the same time don’t want to go and disturb it! Awesome! It’s a dream for me to end up there sometime. Wonderfully crafted and evocative. Reminded me so of Mathiessen, and also in some way, of Hemingway ! Keep writing… And lovely pictures, Divya. Beautiful pictures, very informative.. 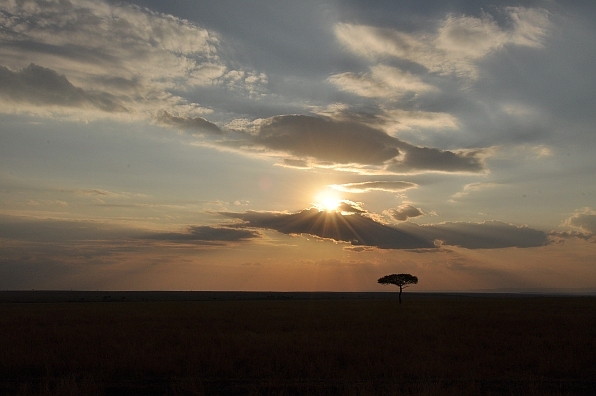 I have always known Masai Mara as a photographer’s heaven… only after reading this article do I realise that there is so much more to think about this magnificient place, and the effect of tourist visits.